The technology available today makes precision possible even outside of a control lab. The laser tracker has many advantages over the traditional methods of metrology. 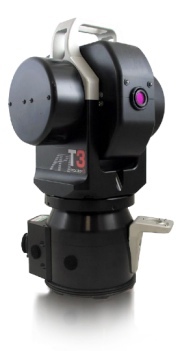 The T3 API laser tracker is one of the smallest IFM/ADM laser trackers avalible, making it easy to use in a wide variety of measuring projects. Because the laser tracker is run with a computer it can actually be managed with just one person. However, in most instances it is much more time efficient to have a two man crew for laser tracker projects. Even with a two man crew it is still more cost effective than traditional metrology measuring tools. The laser tracker can measure points continuously. This means data can be gathered on critical areas like thermal growth, thermal shrinkage, during adjustments, and the laser tracker can track moving machinery safely without human interference. Because the laser tracker can record 3 axis measurements in just a fraction of a second, it is extremely fast for gathering data. With added accessories like the laser tracker arm and 3D scanner data points can be gathered in mass in just minutes. No other method of measuring (outside of a lab) is more precise than a laser tracker. Optical measurement methods are often subject to human error and measurement variation between shots. The laser tracker has a real world tolerance of one thousandth of an inch! For those that like to see numbers of how precise the laser tracker actually is, take a look at these product specifications. The laser tracker has its advantages, but what really makes it a powerful tool is the knowledge and experience that Schaeffer Precision Alignment puts behind the tool itself. We have been providing alignment services since 1989 and we guarantee that we can measure any part, component, machine, tool, or equipment whether it is in our shop or on your own job site. We have the tools to provide premium precision measurements.